Hey what’s that musty smell? Kind of like body odour with the underlying tang of piss? Just kidding! 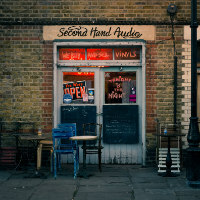 They might be called Second Hand Audio but there’s no way you’ll find the works of DJP and the Breakbeat Junkie nestled between Sonia ‘s Everybody Knows LP and Now That’s What I Call Music 21 in your local Cats Protection League shop – and that is because they have a new EP out – suitably entitled Yes We’re Open. Open to big thumping breakbeats? Yep. And samples? Right on, brother! Not to mention vocalists Kurnel MC and Natty Speaks. The first of these mic marauders appears on the lurching boom bap of Second Hand while the second is on duty for the more rolling, vintage organ-adorned Married To The Music. Remixes come from WBBL who brings a mighty wobble (what else?) to Second Hand while Mr Stabalina – er – also brings a mighty wobble to Married To The Music. Yes We’re Open from Second Hand Audio then. Buy it via the links and you won’t even have to pay Gift Aid.